This ring was designed to link together webpages for the Adventures of Sinbad, second season. ����� Your site is about the Adventures of Sinbad, and or is dedicated to the characters of the second season. If you have a first season site, and just want to to hook it up with all the other AOS sites, that's alright too. 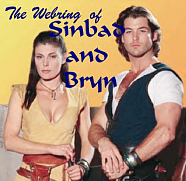 This Webring of Sinbad and Bryn site is owned by Joanna.